The first up is Whiskey Foxtrot, an early batch "Mike" clone that's not quite right. His skill set is quite varied from Oscar Mike, the other clone soldier on the roster. The tech he carries includes a Homemade UPR-SL3 tactical rifle, sticky bombs, and a shrapnel firing Scrap Cannon. By powering up, Whiskey Foxtrot can use overdrive and switch his tactical rifle so that it is fully automatic. After mowing down an enemy, he even gets an attack boost. The cleverly named Kelvin is a close combat ice golem type creature that actually consists of an entire civilization of microorganisms. He (it?) bites and punches his way to victory, even absorbing health after successfully chomping an enemy to death. Kelvin can turn gaseous, boosting his speed and freezing foes or create an ice wall to stun and block enemies. The use of any of his skills generates a temporary shield boost, too. The last up is probably the most interesting out of the bunch - Shane and Aurox. Basically, it is a teenager attached to a giant demon creature. Aurox is the main weapon, and is surprisingly versatile. He is mainly used for close quarters melee, but he can also fetch enemies and teleport to an enemy location. Shane isn't without skills, however. She has her boomerang to take out enemies from a distance. Shane also have the ability to cloak for the element of surprise, and allowing Aurox to drop down and deal damage from above. 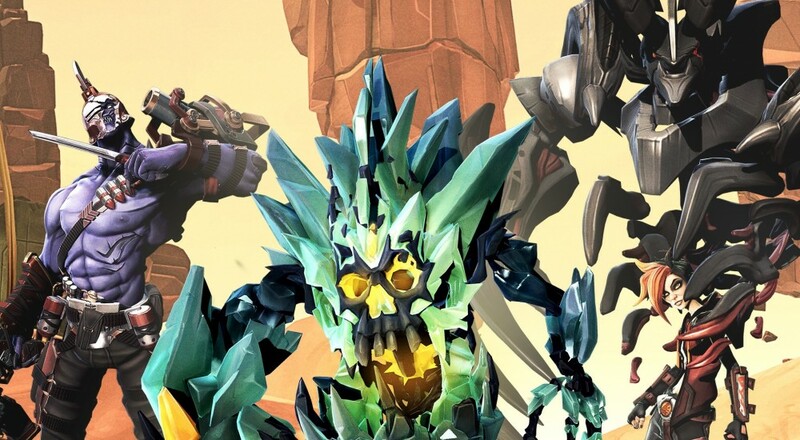 Battleborn will release May 3rd, 2016 on PC, PS4, and Xbox One. Page created in 0.4229 seconds.